Last Friday night, my son Max--who is 11 years old--and I were supposed to go on a Boy Scout camp out. I, by no means, am an outdoorsman. But Max would much rather stay inside than go outside, especially when it's hot out. So, after much wailing and gnashing of teeth, I finally decided to leave him at home and went on the camp out as an adult leader. I grew up in scouting. My grandfather was the town's Cubmaster for years so it was natural that I would join when I came of age. I went through the ranks. Earned my Arrow of Light and became a Boy Scout. Our troop was small but I went to Camp Geiger and was inducted into the tribe of Mic-O-Say and given that name "Little Black Parchment"---named after my grandpa who was "Black Parchment." I rose to the rank of Firebuilder in the tribe and have many memories of Geiger and Mic-O-Say. I went through the scouting ranks. I turned in my package for Eagle Scout before I left for Marine Corps boot camp. Sadly, my scoutmaster never turned it in and I never followed up so I did not get this prestigious award. 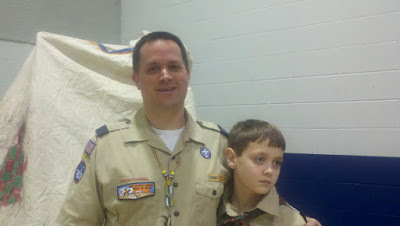 Several years ago, when Max started first grade, I signed him up Cub Scouts. I was then that I realized how much scouting had made me into the person I became. As a son of a single mom, scouting truly helped me become a man. I loved it! I couldn't wait to share the experiences with Max and foresaw him learning the same things that I did. Max isn't your typical eleven year old boy though. Max is unique. Max has certain tendencies and can be socially awkward. Because of these tendencies and awkwardness, Max does not enjoy scouting. He doesn't like camping in the summer when it's hot outside. He doesn't get along with the other boys and he is just bored with it. I've tried to encourage him, bribe and and convince him that it's a way for him and I to spend time together. Last Friday the situation reached a boiling point though and we butted heads. He refused to go. I forced him and we weren't even to the meeting place before I turned around and took him home, broken hearted. I'd been looking forward to spending time with him on this camp out with him and I've come to the conclusion that if I wish to stay involved in Boy Scouts as a leader it may have to be without him. I love Max. He's my only boy. And I really wanted to share Boy Scouts with him and he's rejected it. When we love people, we are supposed to give them all of our love. We are supposed to do whatever we can to make them happy, to help them become better people, and to help them get to Heaven. What happens when they reject what we offer them? What happens when you disagree? What happens when you are fighting and you cannot reach a compromise without someone being hurt? It's a difficult situation. Love calls for sacrifice. We don't always get what we want. Sometimes love hurts. Sacrificing what makes us happy in order to make someone we love happy can be brutally painful. This weekend, I felt like my heart had been pierced with a lance. That's the time when we have to look towards Jesus as a model. He made the ultimate sacrifice. He suffered. He was physically tortured. He gave his life for us to show us the love He has for us. If you want a model of what love is, you only have to look at a crucifix. So, I made a decision this weekend that I didn't want to make. I had to relent in order to show my love. I'm not trying to make myself look pious or make myself into a martyr. After all, many times the sacrifices we make for love go unnoticed. That's okay. We do it for love not for notoriety. Aww, I can (sadly) relate a little bit to this. Nope, not because of boy scouts, but because I have one of my daughters (my youngest daughter and now my "middle" child) where this sort of thing happens on occasion. Her will is as strong as mine and when we don't agree or share the same happiness about something, it is painful. I only say this to let you know that you are not alone in this parental experience. I think as our kids grow up and have their own interests that may not match ours, it's something we all have to grow through. My brother was a Boy Scout and received his Eagle Scout last year. Much of the time he was in scouts, my dad forced him to do it (my dad was never a boy scout himself, but always wanted to be, and so he made up for it by being a leader). My brother has learning disabilities which made organization and getting his Eagle project done very difficult, but I think if you asked him is it probably the accomplishment that he is most proud of. Now that he's too old for scouts, he's become a leader and especially enjoys spending time with a young boy in the troop with autism. I am so grateful to boy scouts for making my brother into a caring and involved young man. Perhaps your son will be able to connect with scouts later on, or maybe it's not the thing for him, but I'm sure that he's gotten quite a bit out of it already (especially the time with dad!) even if you don't notice. This is such a sad story. I am so overwhelmed by your patience and your spirit of sacrifice. Scouting has been a huge blessing in my family's life also. I don't know what we would have done without it. I hope you can find an alternative father-son activity that is a better fit for Max. When my kids started complaining about playing outside in the heat I disconnected the television and the air conditioner and used the electricity bill money we saved to buy a family pass to the local park district swimming pool. That was one of the smartest things I've ever done. My kids spent their summers outside at the pool or reading in the local library. They had fun, stayed active, made friends and developed a love of the water. I guarantee that if you unplug the TV and the air conditioner, Max will find things to do outdoors.